Posted by dostersm on Thursday, January 31, 2019 in Discoveries. 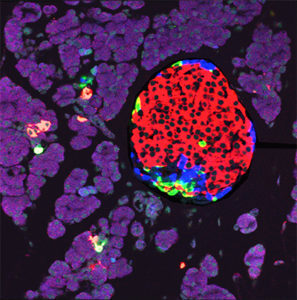 Micrograph of an adult mouse pancreatic islet with immunofluorescence staining for (A) glucagon (α cells, blue), insulin (β cells, red), and somatostatin (δ cells, green). The high pinkish background tissues are mostly acinar and duct cells. Image kindly provided by Guoquiang Gu. Copyright 2019. The pancreatic islets of Langerhans are specialized structures containing five distinct types of cells, (α, β, γ, δ, ε), each of which secretes a different hormone (glucagon, insulin, pancreatic polypeptide, somatostatin, and ghrelin, respectively). Understanding the mechanisms that determine the total and relative quantities of these five islet cell types is key to understanding diabetes, as their combined secretions determine resting and post-prandial blood glucose levels. We know that during embryogenesis, expression of the gene Neurog3 in a population of pancreatic progenitor cells (PPCs) initiates expression of a range of transcription factors in distinctive patterns that lead to differentiation of the various cell types. Each PPC gives rise to a single cell lineage, suggesting that its fate is predetermined; however, we understand little about this predetermination process. To address this question, Vanderbilt Basic Sciences investigators Guoqiang Gu, Ken Lau, Emily Hodges, and David Jacobson, along with their collaborators and laboratories began to examine the role of the Myt1 transcription factor in PPC differentiation. Their initial studies using immunohistochemistry and single cell RNA sequencing demonstrated that cells expressing both Neurog3 and Myt1 were biased toward the β cell lineage. However, PPCs from transgenic mice that overexpressed or were deficient in Myt1 exhibited only modest gains or reductions, respectively, in the relative number of β cells upon differentiation, suggesting that Myt1’s role was marginal. Gene expression analysis of Neurog3-expressing PPCs that also expressed Myt1, in comparison to those that did not, demonstrated that Myt1 expression correlated with changes in the levels of a number of enzymes involved in epigenetic regulation. Further studies using small molecule inhibitors of these enzymes suggested that DNA methyltransferase 1 (Dnmt1) plays a role in determining the fate of differentiating PPCs. Studies of the methylation patterns in the regulatory elements of genes involved in PPC differentiation revealed that overexpression of Dnmt1 resulted in increased methylation of the UR2 region of the Arx gene. Prior work had shown that Arx expression favors differentiation to α cells, whereas suppression of expression through methylation of UR2 favors differentiation to β cells. Upon examining a population of PPCs unable to express Neurog3, the researchers found a distinct pattern of differential expression of DNA methylating genes that was very similar to the pattern observed in wild-type PPCs. These findings suggested that differential regulation of DNA methylation is programed into PPCs before differentiation is initiated by Neurog3 expression. Together, the results support the hypothesis that DNA methylation of the regulatory elements of key genes is a very early step in determining the fate of PPCs. It precedes Neurog3 expression and leads to the distinct transcription patterns associated with the various islet cell lineages. The hypothesis supports an important role for epigenetic regulation in early stages of PPC lineage determination and sets the stage for future work to define exactly how this mechanism guides differentiation toward each cell lineage. The work is published in the journal Developmental Cell [J. Liu, et al. (2019) Dev. Cell, 48, 49].